PCBs: A bulk product or a waste?  PCBs in Building Materials—Should You Test for Them? EPA's final reinterpretation of its position regarding polychlorinated biphenyl (PCB) disposal regulations regarding PCB bulk product and PCB remediation waste is intended to speed up removal and disposal of PCB material and reduce costs. 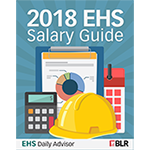 In recent years, EPA has learned a great deal about the extent to which products manufactured to contain PCBs (e.g., paint and caulk) were used in many buildings, including schools, before the manufacture of PCBs was banned by the Toxic Substances Control Act (TSCA). As more buildings were discovered to have PCB contamination, it was also discovered that sometimes PCBs leach from those PCB manufactured products into attached porous building materials. EPA has received many requests to address difficulties the regulated community faces when disposing of this waste properly. In February 2012, EPA issued a proposed reinterpretation to address these concerns and to further protect public health and the environment. TSCA regulations at 40 CPR 761 provide disposal and cleanup requirements for PCBs. The disposal and cleanup requirements for PCB-contaminated building material depend on whether the material is classified as a PCB bulk product waste (40 CFR 761.62) or PCB remediation waste (40 CFR 761.61). Since TSCA authority has not been delegated to any of the states, both EPA and state regulations apply. Knowing your specific federal and state requirements for PCB management is essential if you want to remain in compliance with applicable federal and state regulations. PCB remediation waste is waste containing PCBs as a result of a spill or release (date and concentration limits apply), e.g., PCB-contaminated soil, sediments, and concrete. PCB bulk product waste is waste derived from products manufactured to contain PCBs in a non-liquid state at 50 ppm or greater. Typical examples are caulk, paint, and sealants. PCB-containing caulk, for example, is considered PCB bulk product waste if the concentration of PCBs in the caulk is greater than or equal to 50 parts per million (ppm) (or even less by some state standards, such as Connecticut). If PCBs have contaminated either the surrounding building materials or adjacent soil, these materials are considered PCB remediation waste. EPA’s reinterpretation ensures that building materials contaminated with PCBs have disposal options that are efficient, safe, and straightforward. For example, the reinterpretation will mean that the disposal options for the masonry are the same as for the attached PCB caulk. The reinterpretation specifically addresses the definitions of bulk product waste and remediation waste. This distinction is important as it determines the appropriate cleanup requirements and disposal options. 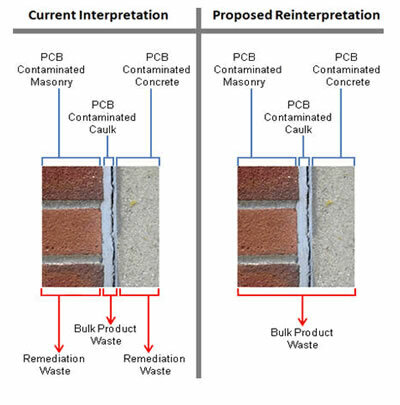 The reinterpretation allows building material (i.e., substrate) “coated or serviced” with PCB bulk product waste (e.g., caulk, paint, mastics, sealants) at the time of disposal to be managed as a PCB bulk product waste, even if the PCBs have migrated from the overlying bulk product waste into the substrate. The following diagram highlights these changes to the definitions. Via a risk-based disposal approval process. For situations where PCB caulk, paint, etc. remain attached to building materials, this reinterpretation allows for more efficient removal and disposal. In order to dispose of PCB bulk product waste in a state-permitted municipal landfill or non-municipal non-hazardous waste landfill, there may be additional sampling, recordkeeping and performance requirements that must be satisfied. Be sure to review 40 CFR 761.62 for specific requirements. In addition, the remediation waste may be managed as bulk product waste only if it is attached to the contaminated abutting material at the time the material is designated for disposal. If the caulk or paint has been removed from the building material, the substrate would be considered a PCB remediation waste subject to strict management and disposal requirements at concentrations down to 1 ppm. shared in anyway, or displayed on this site.